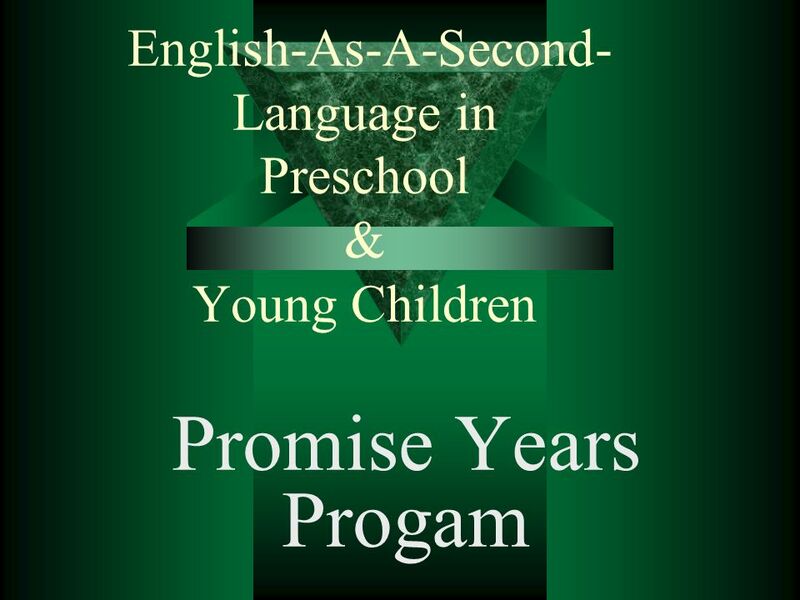 English-As-A-Second- Language in Preschool & Young Children Promise Years Progam. 2 WHO ARE ESLs? 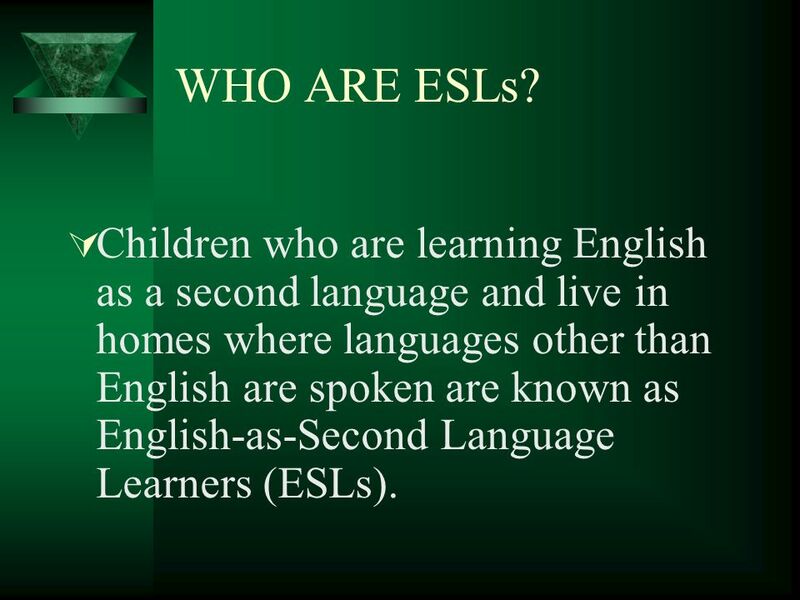 Children who are learning English as a second language and live in homes where languages other than English are spoken are known as English-as-Second Language Learners (ESLs). 3 What Challenges Do They Face? As these children enter kindergarten, they often lag behind their language-majority peers in the skills necessary to start reading, with the gap remaining throughout their school years. 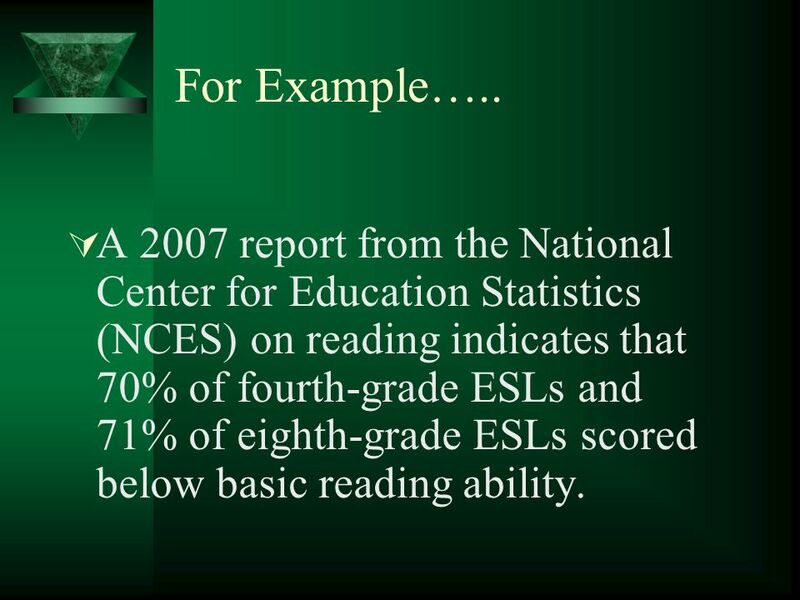 4 For Example….. A 2007 report from the National Center for Education Statistics (NCES) on reading indicates that 70% of fourth-grade ESLs and 71% of eighth-grade ESLs scored below basic reading ability. 5 What can be done? 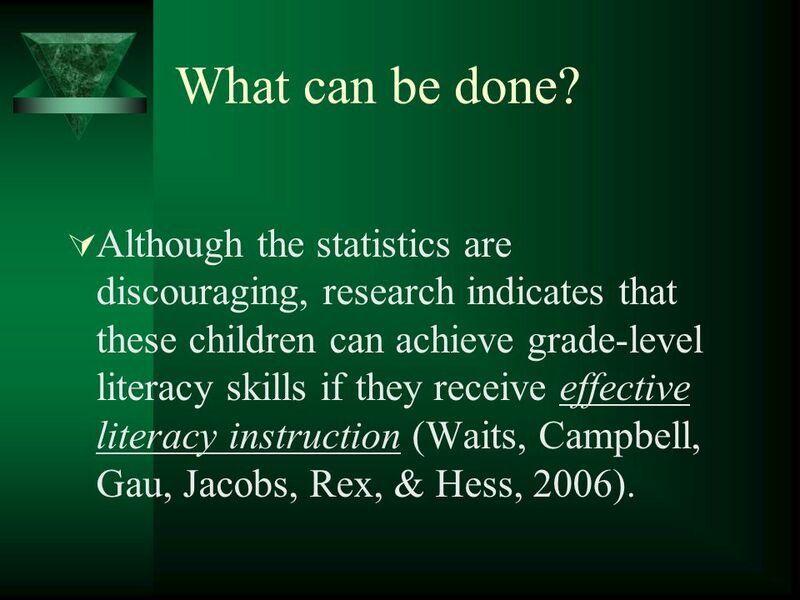 Although the statistics are discouraging, research indicates that these children can achieve grade-level literacy skills if they receive effective literacy instruction (Waits, Campbell, Gau, Jacobs, Rex, & Hess, 2006). 6 How can Preschool Programs help? Preschool programs can have a direct impact on the academic skills of ESLs, potentially closing the gap with quality education. 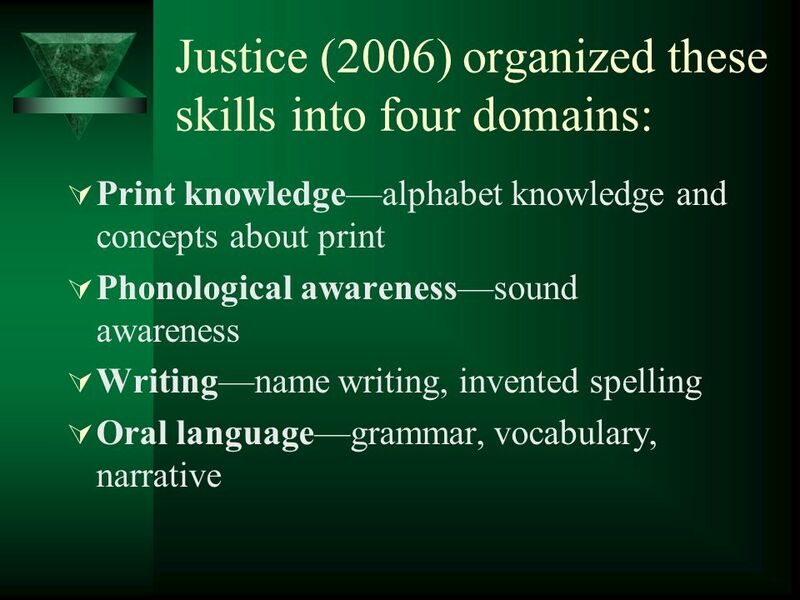 7 The National Early Literacy Panel (2004) identified Alphabet knowledge, phonological awareness, writing, oral language skills, & knowledge of print in preschool are predictors of later reading & writing success in elementary school children. 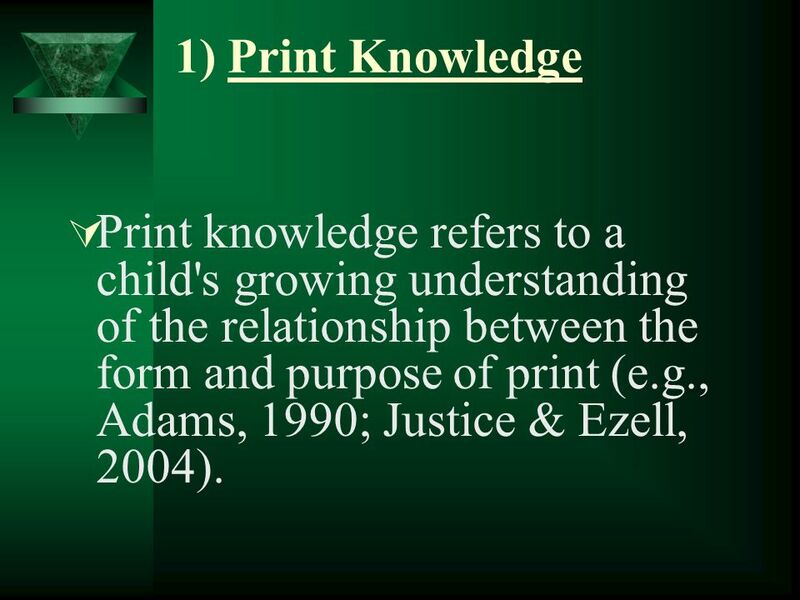 9 1) Print Knowledge Print knowledge refers to a child's growing understanding of the relationship between the form and purpose of print (e.g., Adams, 1990; Justice & Ezell, 2004). 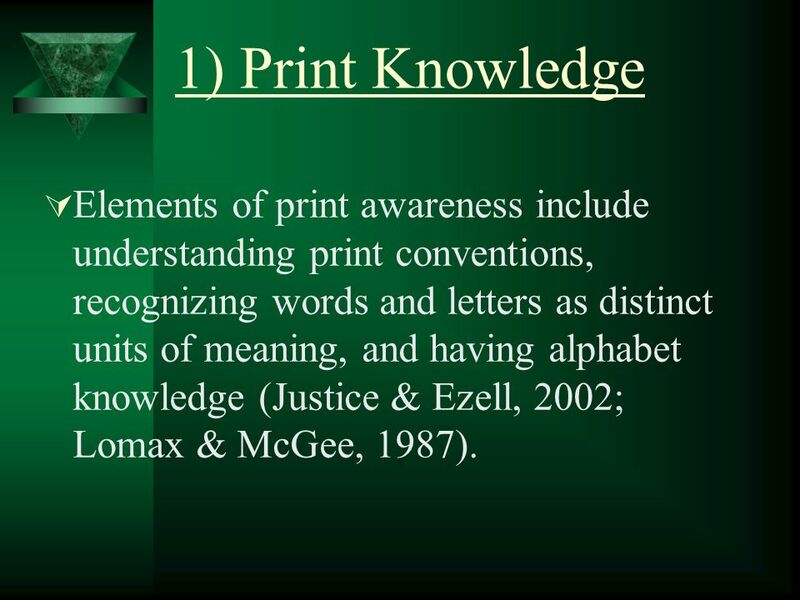 10 1) Print Knowledge Elements of print awareness include understanding print conventions, recognizing words and letters as distinct units of meaning, and having alphabet knowledge (Justice & Ezell, 2002; Lomax & McGee, 1987). 11 The importance of Print Knowledge……. 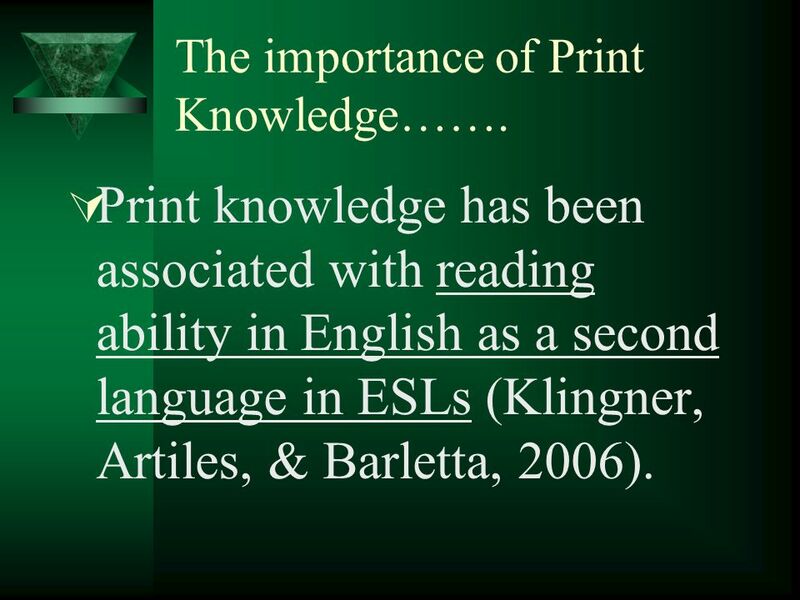 Print knowledge has been associated with reading ability in English as a second language in ESLs (Klingner, Artiles, & Barletta, 2006). 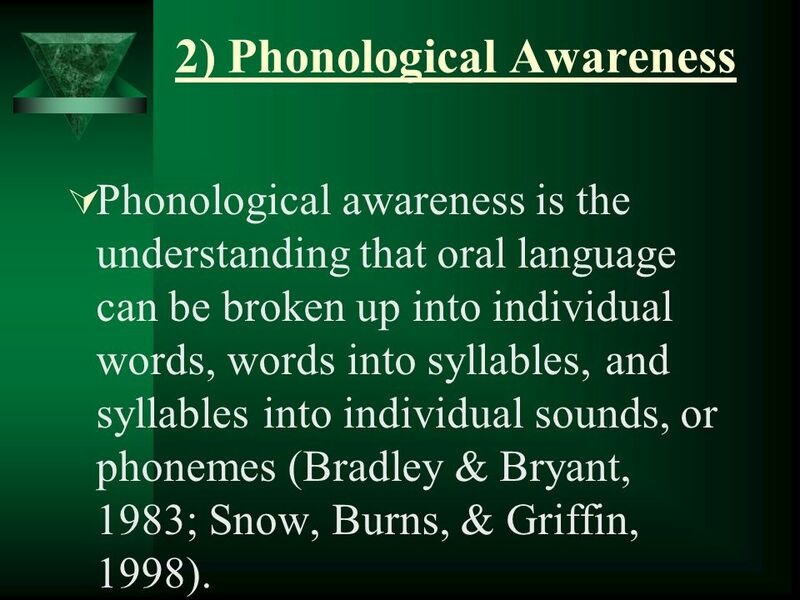 12 2) Phonological Awareness Phonological awareness is the understanding that oral language can be broken up into individual words, words into syllables, and syllables into individual sounds, or phonemes (Bradley & Bryant, 1983; Snow, Burns, & Griffin, 1998). 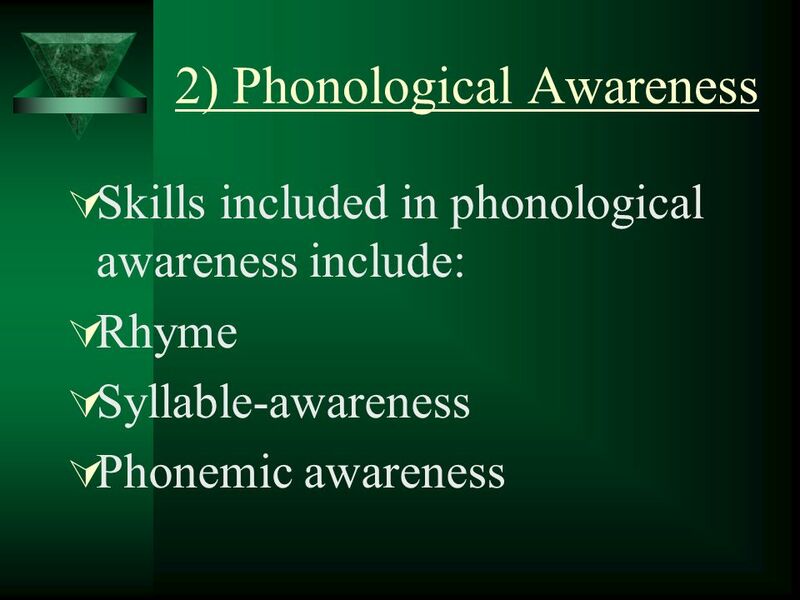 14 How is Phonological Awareness Learned? 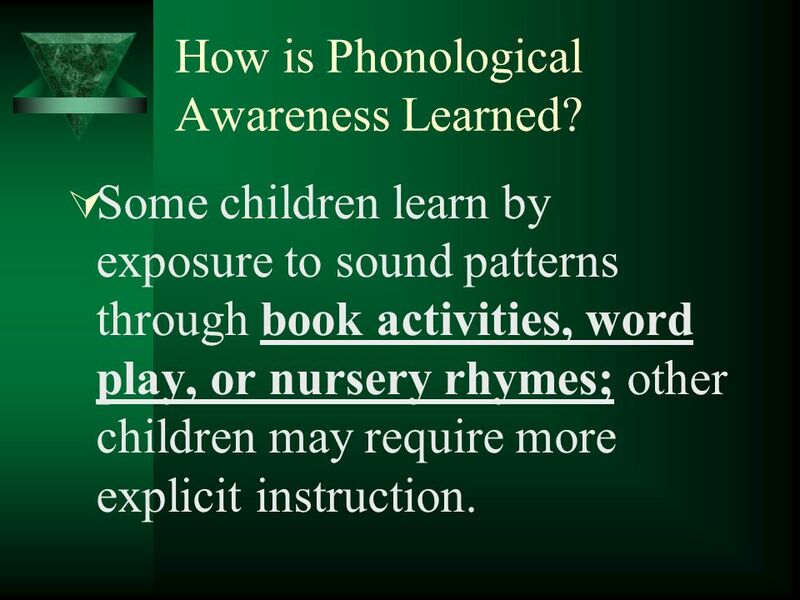 Some children learn by exposure to sound patterns through book activities, word play, or nursery rhymes; other children may require more explicit instruction. 15 Children who do well on sound- awareness tasks are better readers than their peers who struggle with those tasks (Adams, 1990; Wagner & Torgeson, 1987). 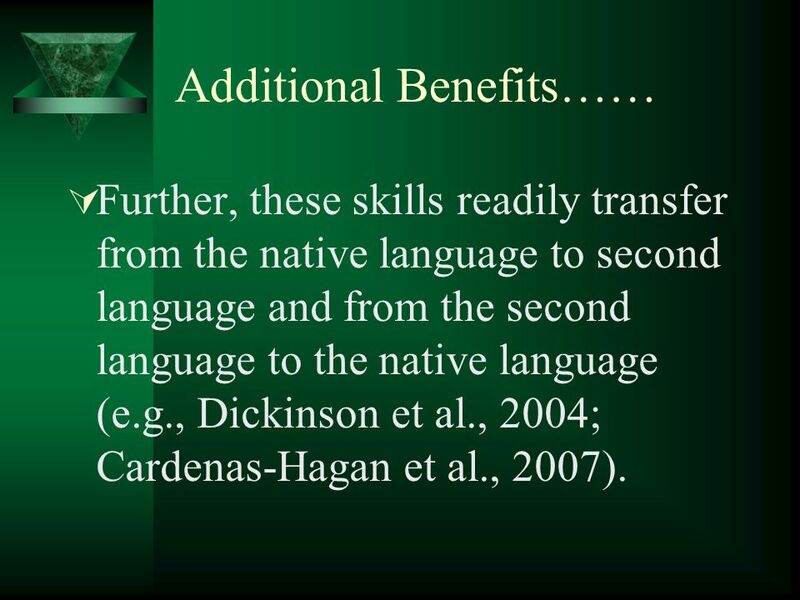 17 Additional Benefits…… Further, these skills readily transfer from the native language to second language and from the second language to the native language (e.g., Dickinson et al., 2004; Cardenas-Hagan et al., 2007). 18 3) Writing…. 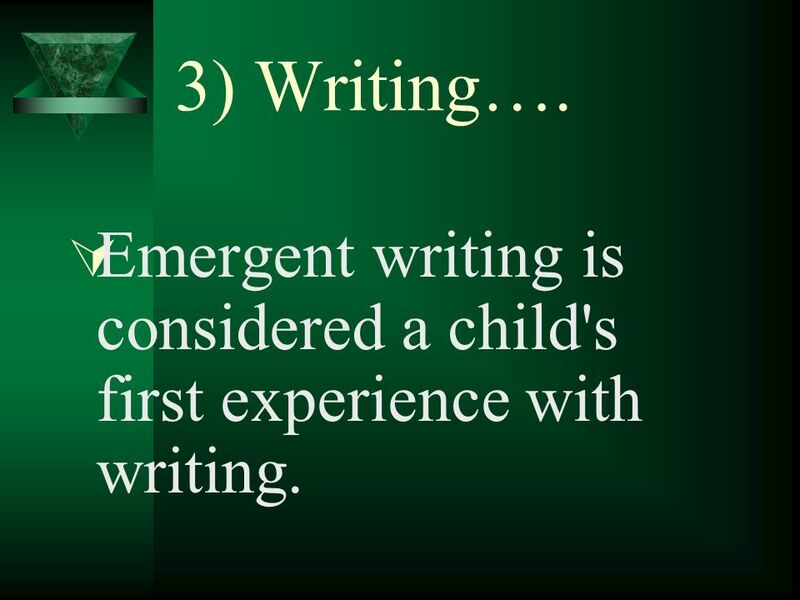 Emergent writing is considered a child's first experience with writing. 19 3) Writing…. This early writing appears during the preschool years and follows a sequence that progresses from drawings to scribbles, invented spelling, and eventually conventional writing; this progression continues during the school-age years and beyond (Teale & Sulzby, 1986). 20 3) Writing…. Children's early experiences in experimenting with different forms of writing support later reading and writing success (Adams, 1990; Richgels, 1995). 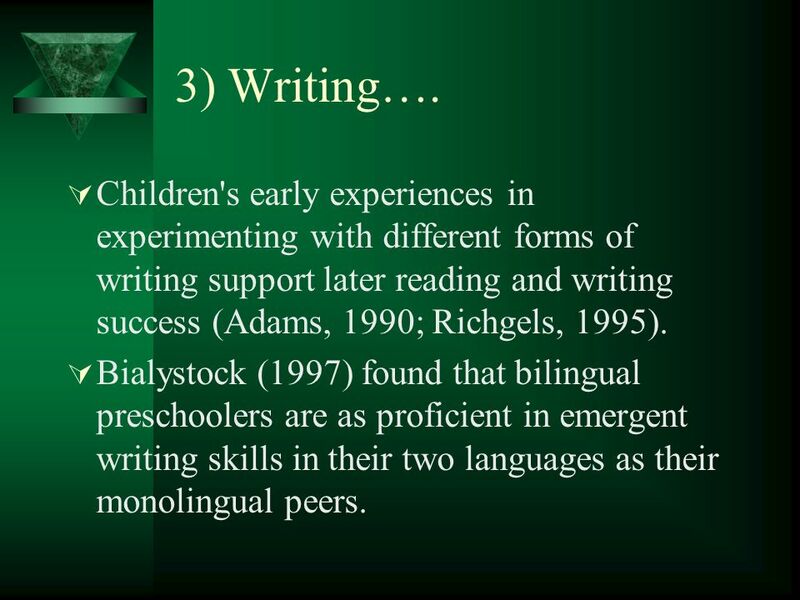 Bialystock (1997) found that bilingual preschoolers are as proficient in emergent writing skills in their two languages as their monolingual peers. 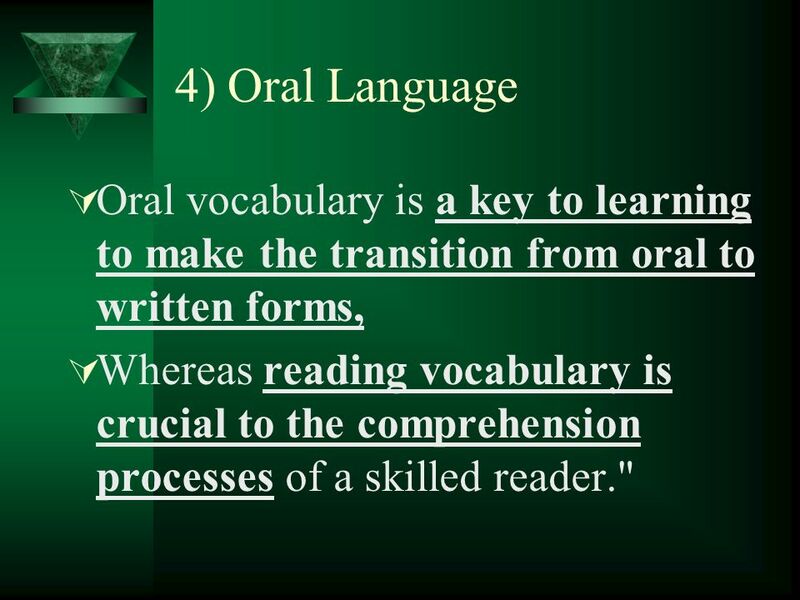 22 4) Oral Language Oral vocabulary is a key to learning to make the transition from oral to written forms, Whereas reading vocabulary is crucial to the comprehension processes of a skilled reader." 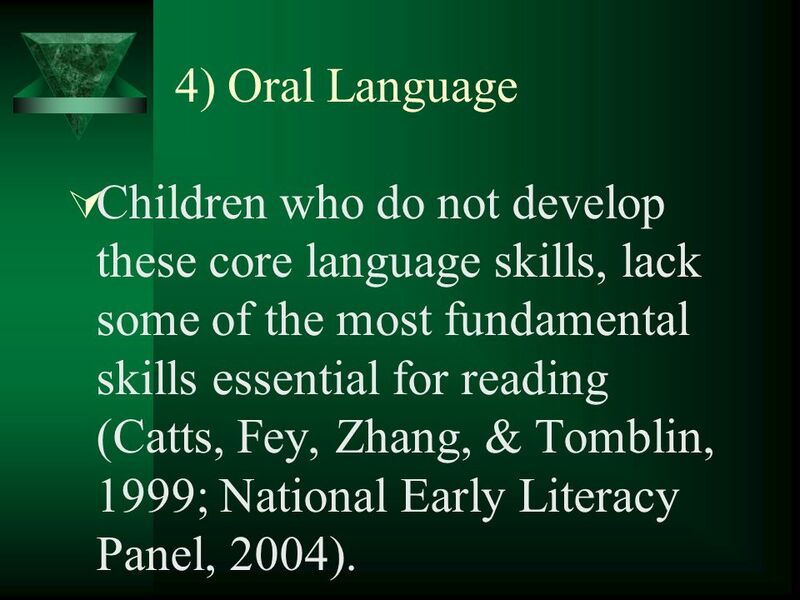 23 4) Oral Language Children who do not develop these core language skills, lack some of the most fundamental skills essential for reading (Catts, Fey, Zhang, & Tomblin, 1999; National Early Literacy Panel, 2004). 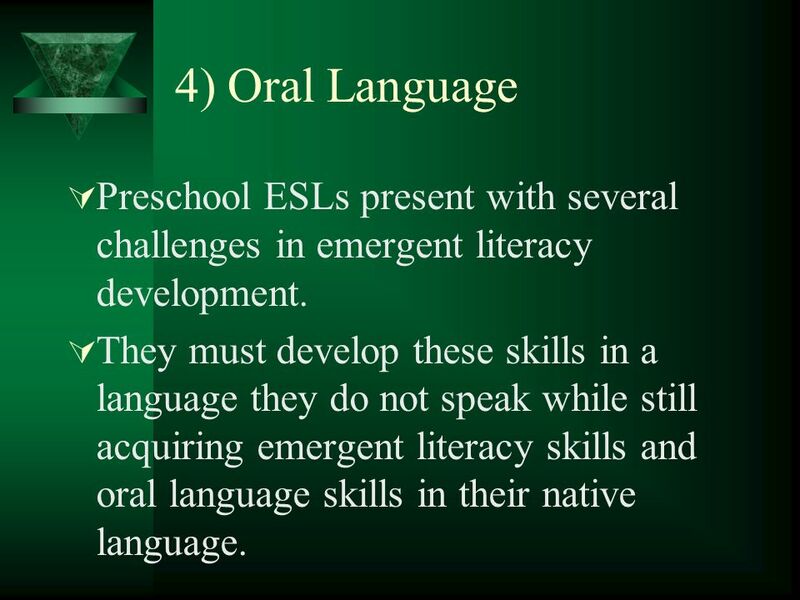 24 4) Oral Language Preschool ESLs present with several challenges in emergent literacy development. They must develop these skills in a language they do not speak while still acquiring emergent literacy skills and oral language skills in their native language. 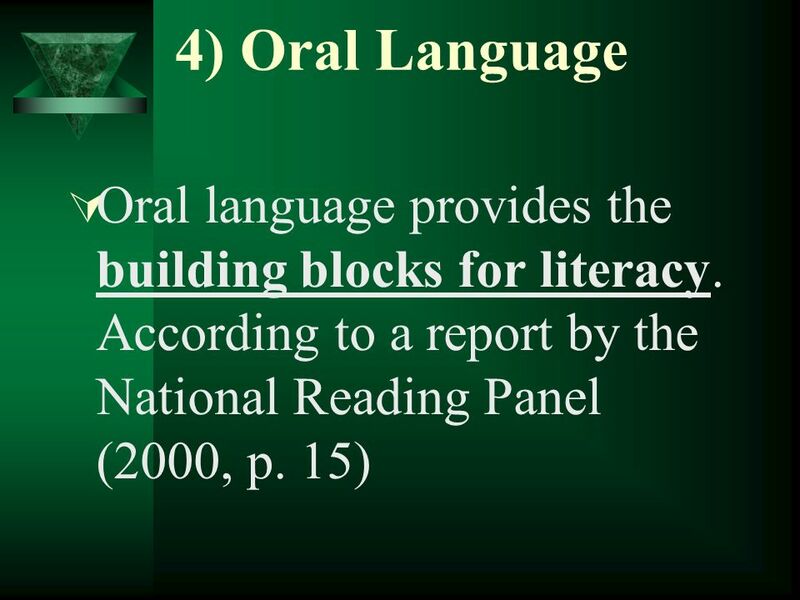 25 4) Oral Language Therefore, one of the most critical emergent literacy skills for ESLs to develop is oral language in the native and second languages. 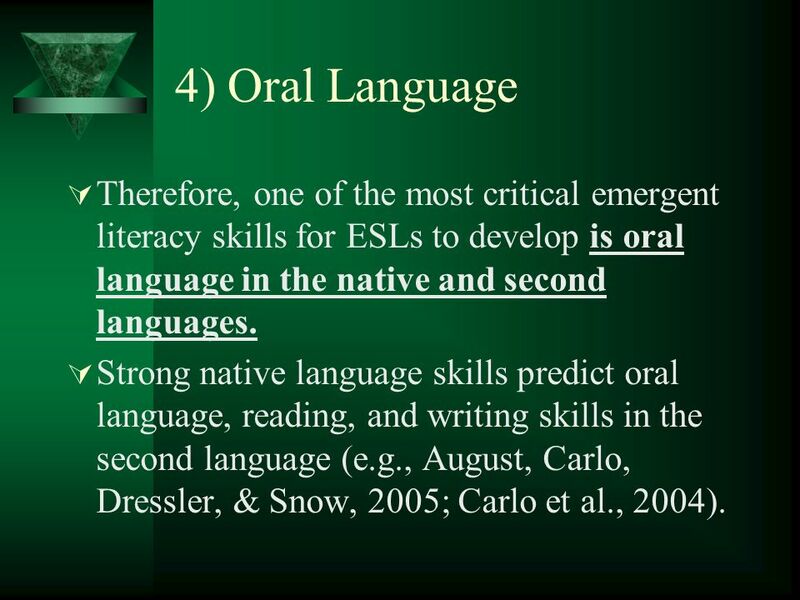 Strong native language skills predict oral language, reading, and writing skills in the second language (e.g., August, Carlo, Dressler, & Snow, 2005; Carlo et al., 2004). 26 1) Activities Associated with Print Knowledge Several evidence-based techniques promote emergent literacy skills in preschoolers. 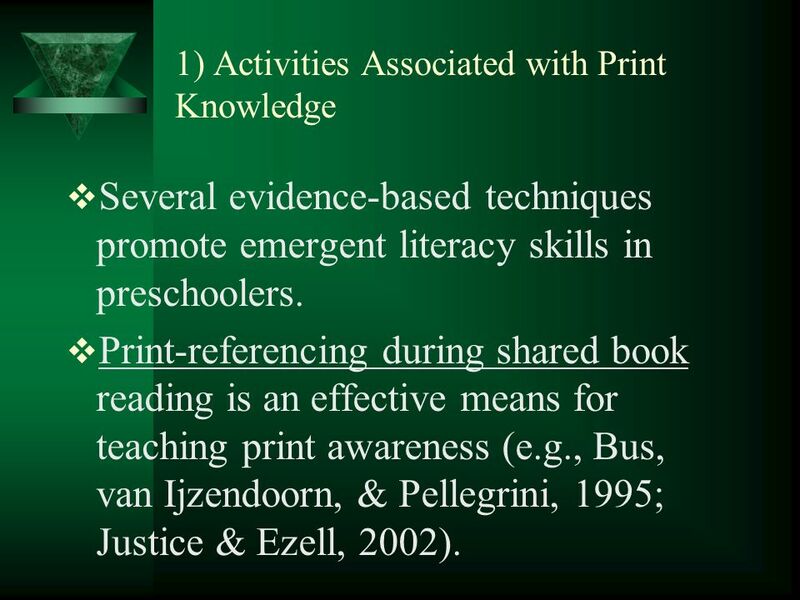 Print-referencing during shared book reading is an effective means for teaching print awareness (e.g., Bus, van Ijzendoorn, & Pellegrini, 1995; Justice & Ezell, 2002). 28 3) Activities Associated with Writing Emergent writing is considered a child's first experience with writing. 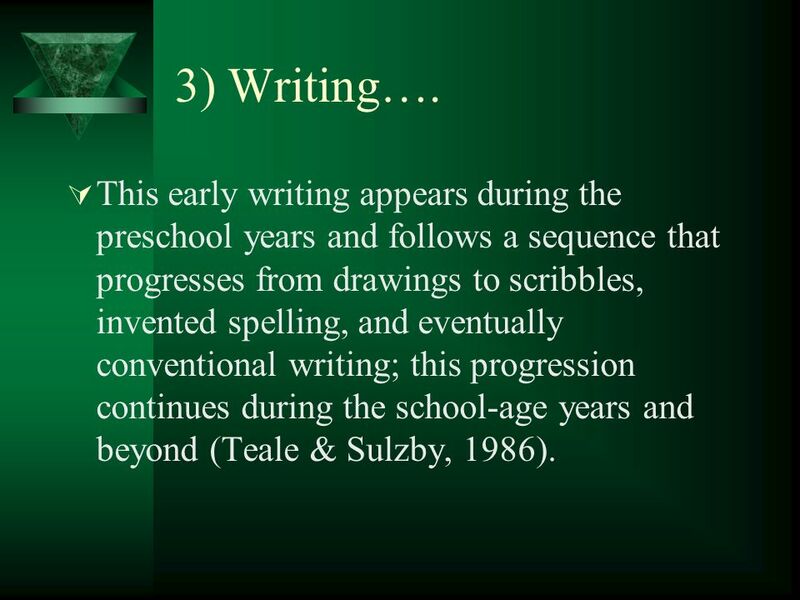 This early writing appears during the preschool years and follows a sequence that progresses from drawings to scribbles, invented spelling, and eventually conventional writing; this progression continues during the school-age years and beyond (Teale & Sulzby, 1986). 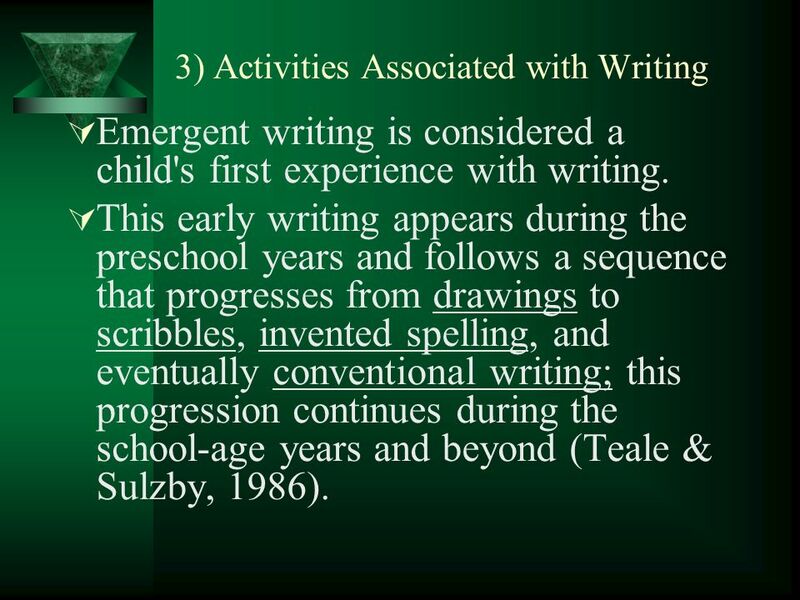 29 Emergent Writing..condt Children's early experiences in experimenting with different forms of writing support later reading and writing success (Adams, 1990; Richgels, 1995). 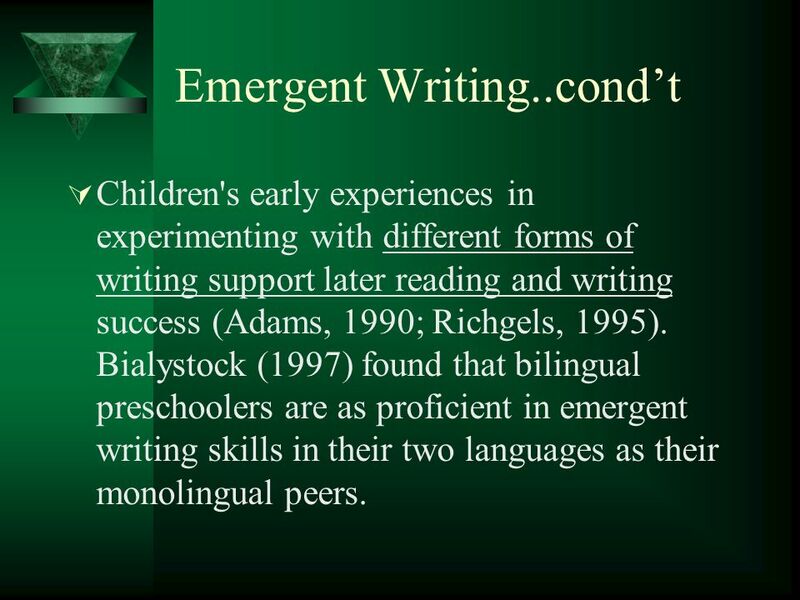 Bialystock (1997) found that bilingual preschoolers are as proficient in emergent writing skills in their two languages as their monolingual peers. 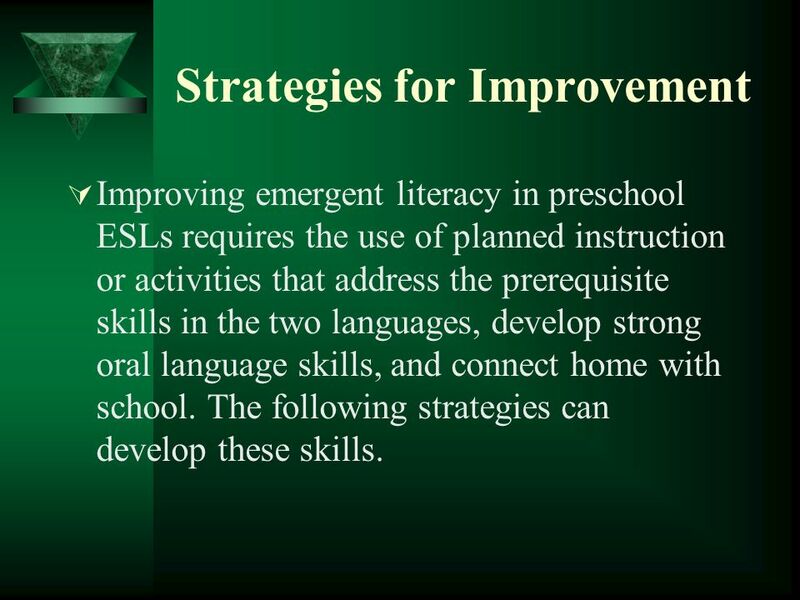 31 Strategies for Improvement Improving emergent literacy in preschool ESLs requires the use of planned instruction or activities that address the prerequisite skills in the two languages, develop strong oral language skills, and connect home with school. The following strategies can develop these skills. 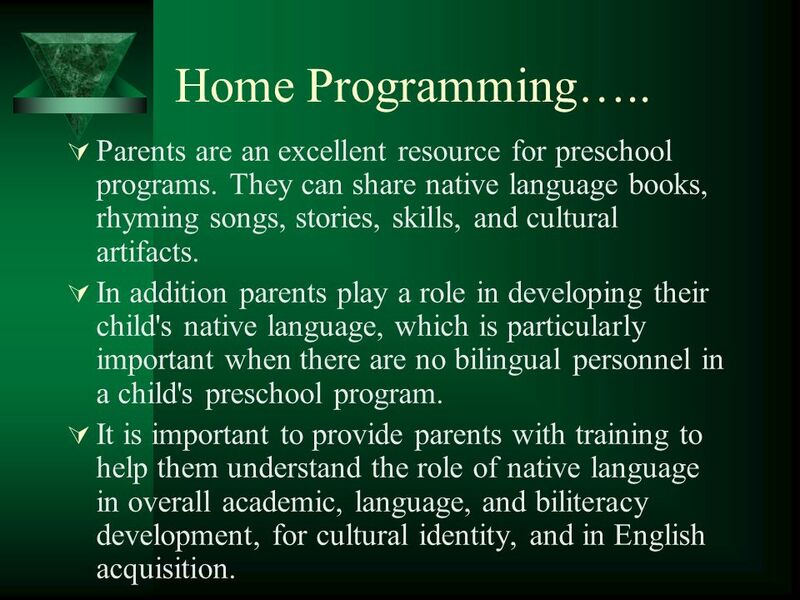 32 Home Programming….. Parents are an excellent resource for preschool programs. They can share native language books, rhyming songs, stories, skills, and cultural artifacts. In addition parents play a role in developing their child's native language, which is particularly important when there are no bilingual personnel in a child's preschool program. 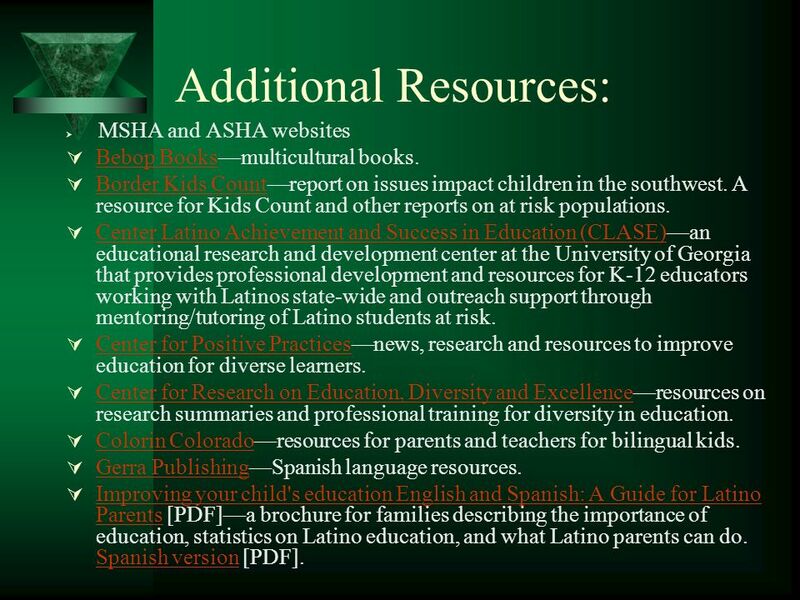 It is important to provide parents with training to help them understand the role of native language in overall academic, language, and biliteracy development, for cultural identity, and in English acquisition. 33 Home Planning, condt Training can help parents understand aspects of the school culture in the North America, such as expectations related to homework and achievement, school involvement, and grade-level performance. Many parents may be satisfied with their child's development but may not know that their child is behind in emergent literacy skills in the native or second language. For example parents may think that at the end of preschool their child is doing well because the child can communicate basic needs in English, but they may not know that the kindergarten teacher expects the child to know some letters, colors, and shapes. Explaining these expectations helps parents understand the system better and helps ensure that the child is better prepared. 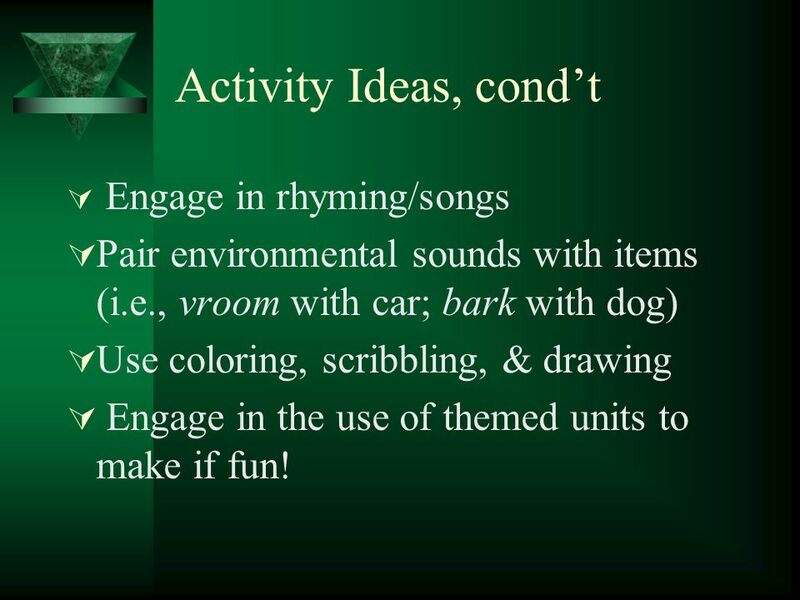 35 Activity Ideas, condt Engage in rhyming/songs Pair environmental sounds with items (i.e., vroom with car; bark with dog) Use coloring, scribbling, & drawing Engage in the use of themed units to make if fun! 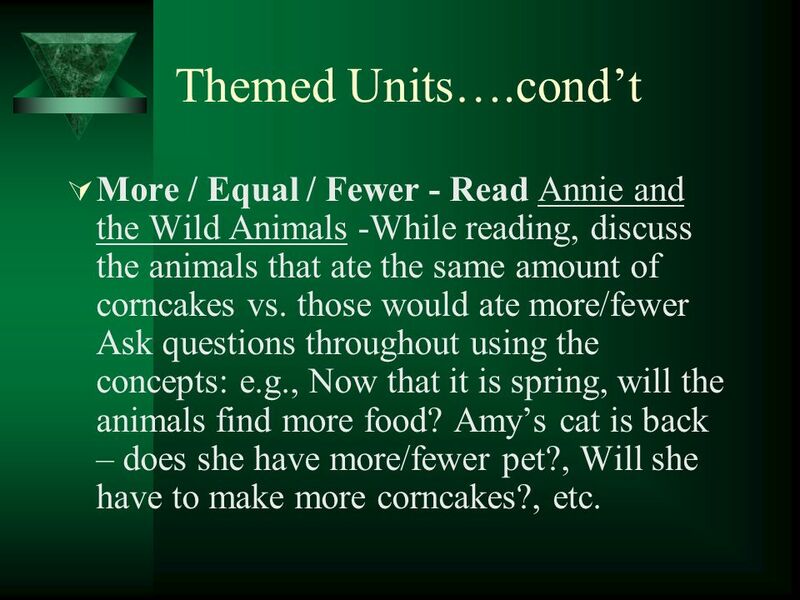 39 Themed Units….condt More / Equal / Fewer - Read Annie and the Wild Animals -While reading, discuss the animals that ate the same amount of corncakes vs. those would ate more/fewer Ask questions throughout using the concepts: e.g., Now that it is spring, will the animals find more food? Amys cat is back – does she have more/fewer pet?, Will she have to make more corncakes?, etc. 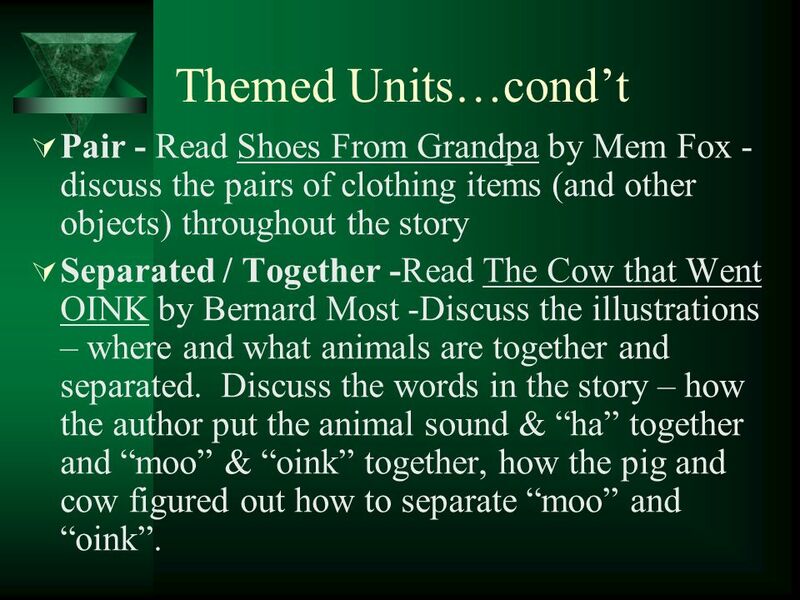 40 Themed Units…condt Pair - Read Shoes From Grandpa by Mem Fox - discuss the pairs of clothing items (and other objects) throughout the story Separated / Together -Read The Cow that Went OINK by Bernard Most -Discuss the illustrations – where and what animals are together and separated. 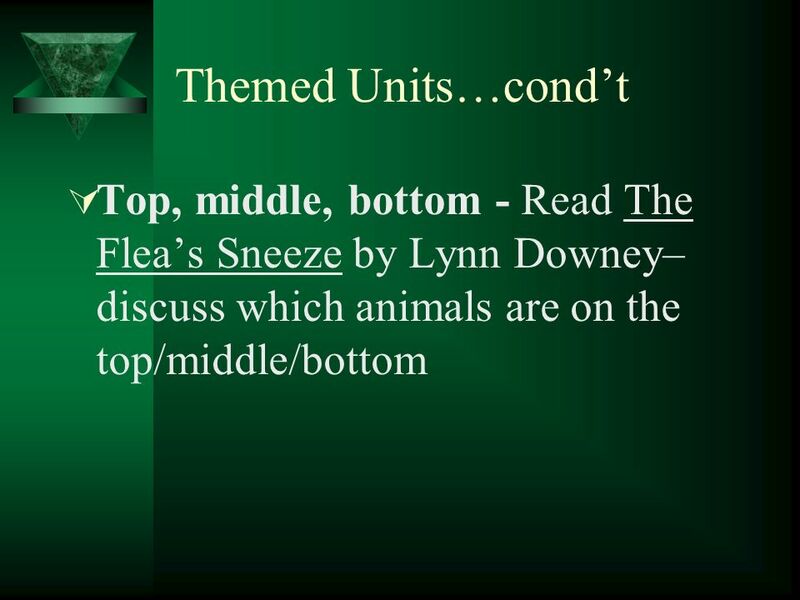 Discuss the words in the story – how the author put the animal sound & ha together and moo & oink together, how the pig and cow figured out how to separate moo and oink. 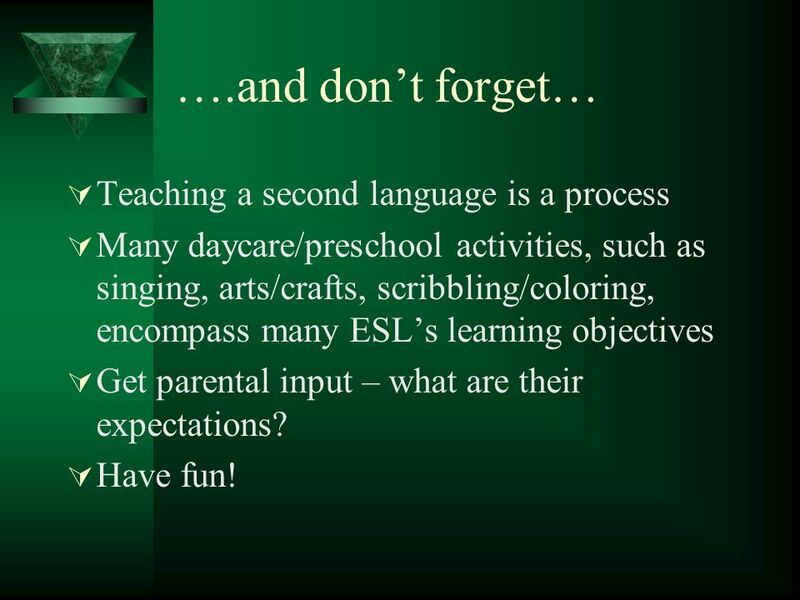 43 ….and dont forget… Teaching a second language is a process Many daycare/preschool activities, such as singing, arts/crafts, scribbling/coloring, encompass many ESLs learning objectives Get parental input – what are their expectations? Have fun! 47 References Adams, M. J. (1990). Beginning to read. Cambridge, MA: MIT Press. August, D., Carlo, M., Dressler, C., & Snow, C. (2005). 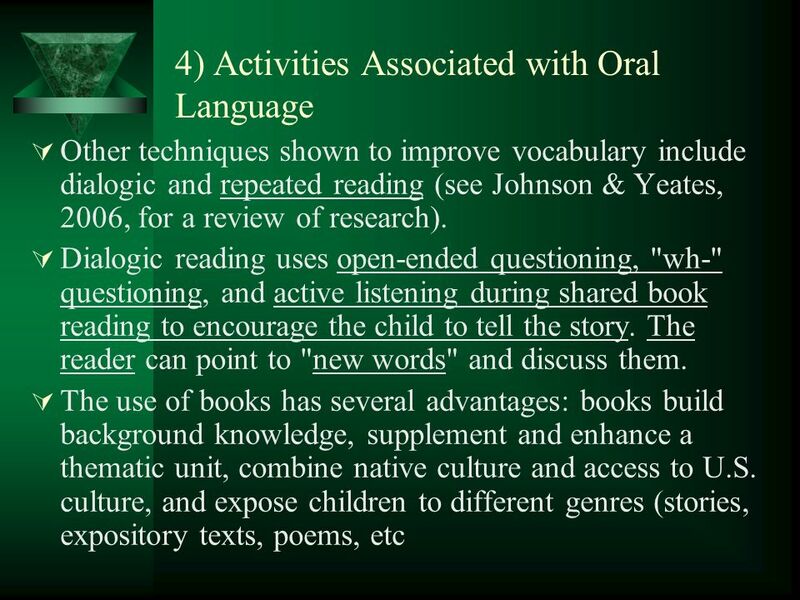 The Critical Role of Vocabulary Development for English Language Learners. Learning Disabilities Research and Practice. Bialystok, E. (1997). Effects on Bilingualism and Biliteracy on Children's Emerging Concepts of Print. Developmental Psychology, 33, 429-440. Bradley, L., & Bryant, P. E. (1983). Categorizing sounds and learning to read: A causal connection. Nature, 301, 419-421. Cardenas-Hagan, E., Carlson, C. D., & Pollard-Durodola, S. D. (2007). The cross-linguistic transfer of early literacy skills: The role of initial L1 and L2 skills and language of instruction. Language, Speech, and Hearing Services in Schools, 38, 249-259. Carlo, M., August, D., McLaughlin, B., Snow, C. E., Dressler, C., Lippman, D. N. et al. (2004). Closing the gap: Addressing the vocabulary needs of English language learners in bilingual mainstream classrooms. Reading Research Quarterly, 39, 188-215. Catts, H. W., Fey, M. E., Zhang, X., & Tomblin, J. B. (1999). Language basis of reading and reading disabilities: Evidence from a longitudinal investigation. Scientific Studies of Reading, 3, 331-361. Dickinson, D., McCabe A., Clark-Chiarelli, N., & Wolf, A. (2004). Cross-language transfer of phonological awareness in low- income Spanish and English bilingial preschool children. Applied Psycholinguistics, 25, 323-347. Genesee, F., Lindholm-Leary, K., Saunders, W., & Christian, D. (2005). 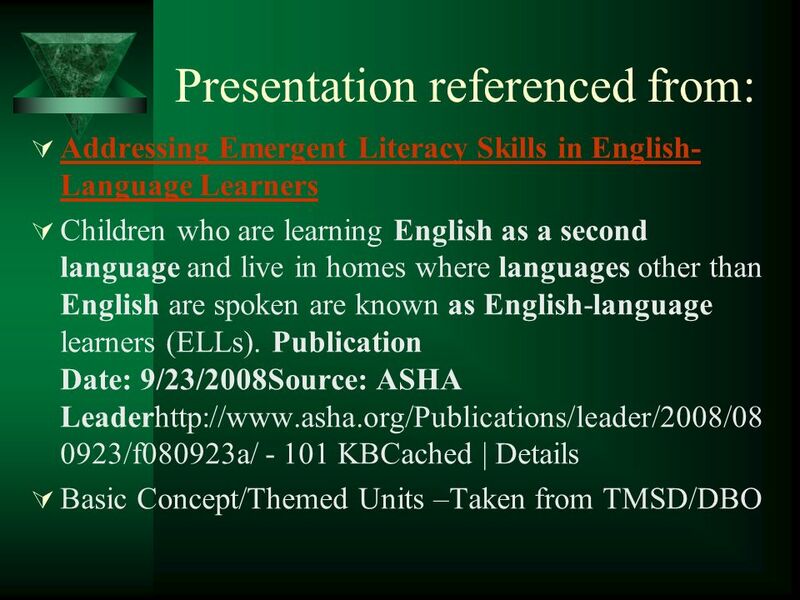 English language learners in U.S. schools: An overview of research findings. Journal of Education for Student Placed at Risk, 10(4), 363-385. Justice, L. M. (2006). 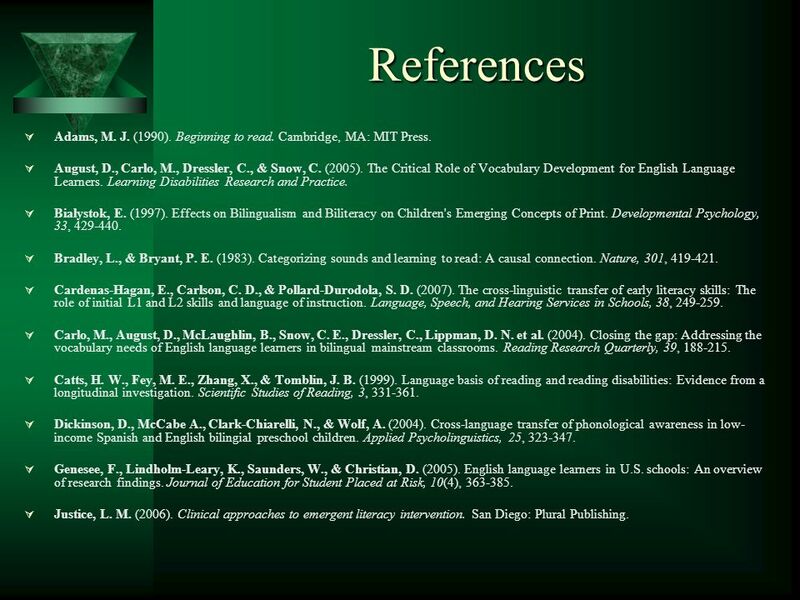 Clinical approaches to emergent literacy intervention. San Diego: Plural Publishing. 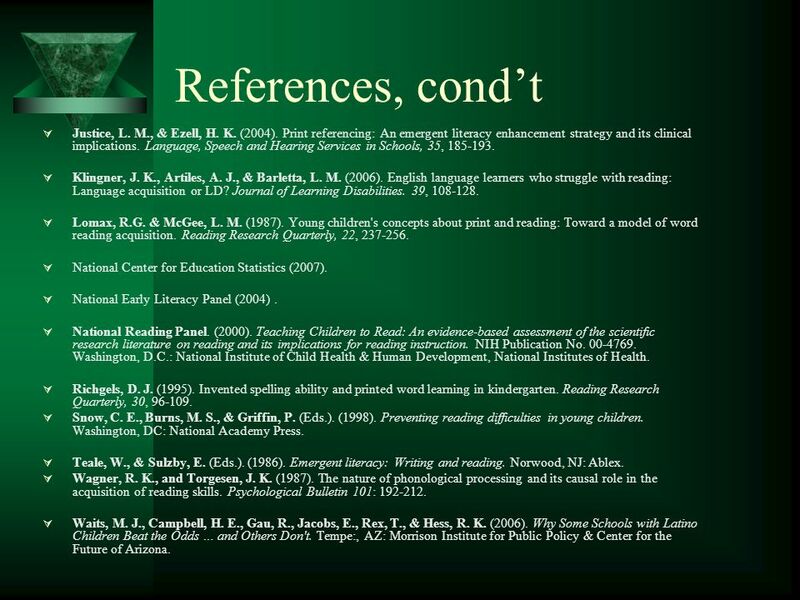 48 References, condt Justice, L. M., & Ezell, H. K. (2004). Print referencing: An emergent literacy enhancement strategy and its clinical implications. Language, Speech and Hearing Services in Schools, 35, 185-193. Klingner, J. K., Artiles, A. J., & Barletta, L. M. (2006). 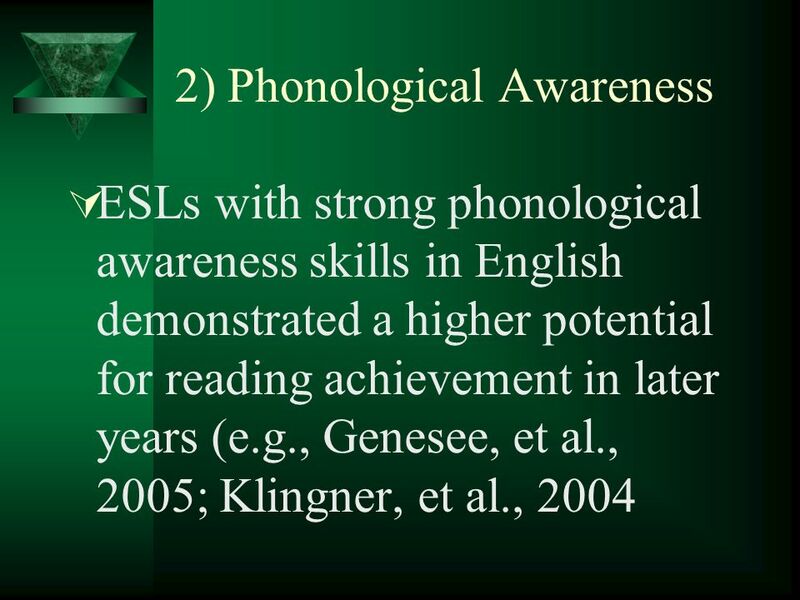 English language learners who struggle with reading: Language acquisition or LD? Journal of Learning Disabilities. 39, 108-128. Lomax, R.G. & McGee, L. M. (1987). 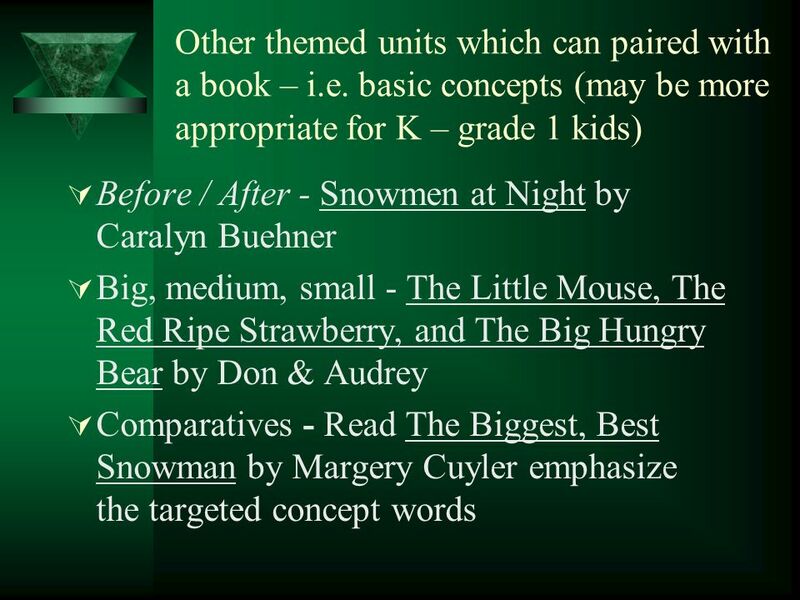 Young children's concepts about print and reading: Toward a model of word reading acquisition. Reading Research Quarterly, 22, 237-256. National Center for Education Statistics (2007). 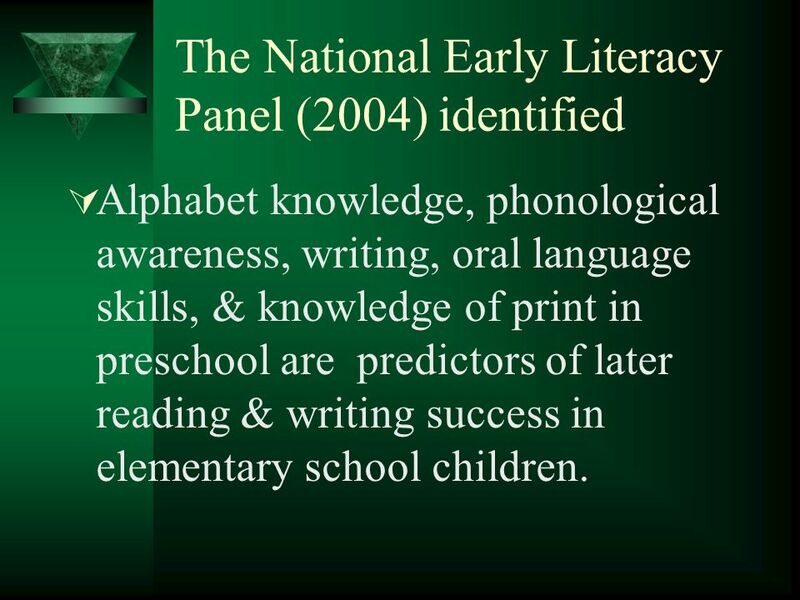 National Early Literacy Panel (2004). National Reading Panel. (2000). Teaching Children to Read: An evidence-based assessment of the scientific research literature on reading and its implications for reading instruction. NIH Publication No. 00-4769. Washington, D.C.: National Institute of Child Health & Human Development, National Institutes of Health. Richgels, D. J. (1995). Invented spelling ability and printed word learning in kindergarten. Reading Research Quarterly, 30, 96-109. Snow, C. E., Burns, M. S., & Griffin, P. (Eds.). (1998). Preventing reading difficulties in young children. Washington, DC: National Academy Press. Teale, W., & Sulzby, E. (Eds.). (1986). 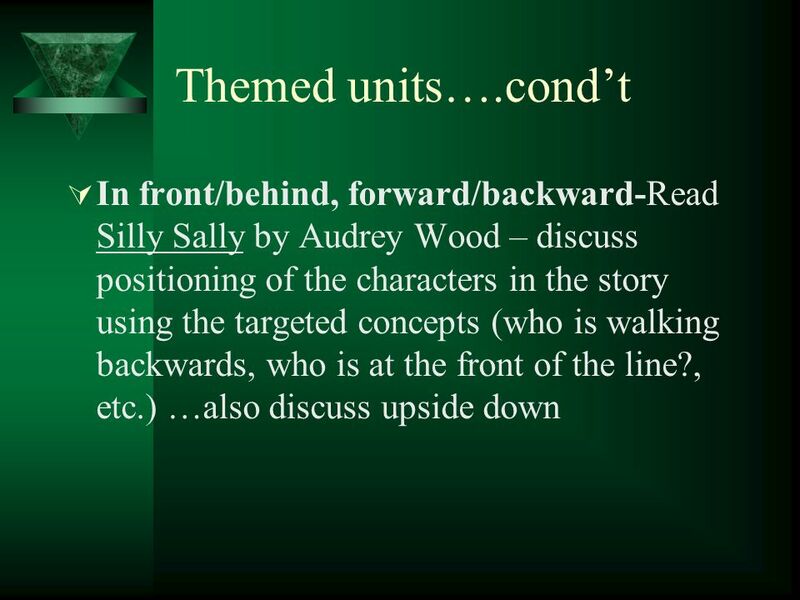 Emergent literacy: Writing and reading. Norwood, NJ: Ablex. Wagner, R. K., and Torgesen, J. K. (1987). 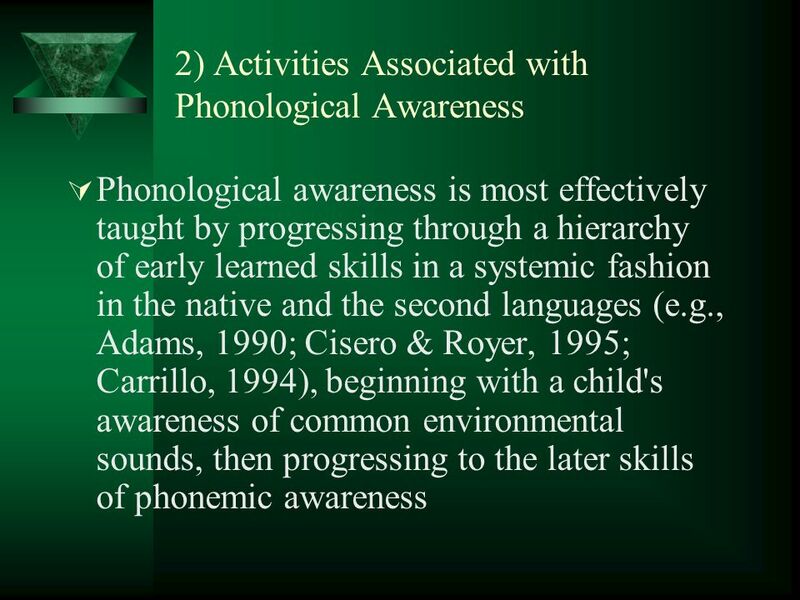 The nature of phonological processing and its causal role in the acquisition of reading skills. Psychological Bulletin 101: 192-212. Waits, M. J., Campbell, H. E., Gau, R., Jacobs, E., Rex, T., & Hess, R. K. (2006). Why Some Schools with Latino Children Beat the Odds … and Others Don't. Tempe:, AZ: Morrison Institute for Public Policy & Center for the Future of Arizona. 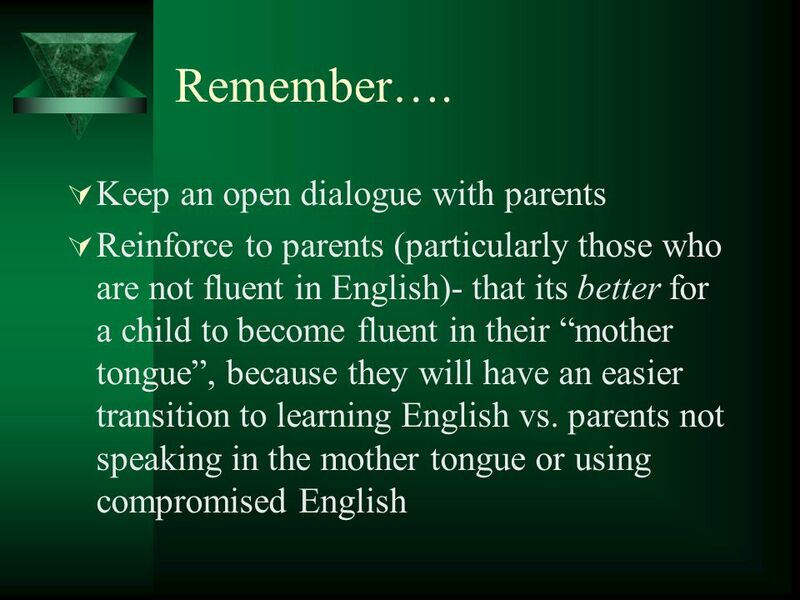 Download ppt "English-As-A-Second- Language in Preschool & Young Children Promise Years Progam." Working document. Not to be distributed without CDE Permission. 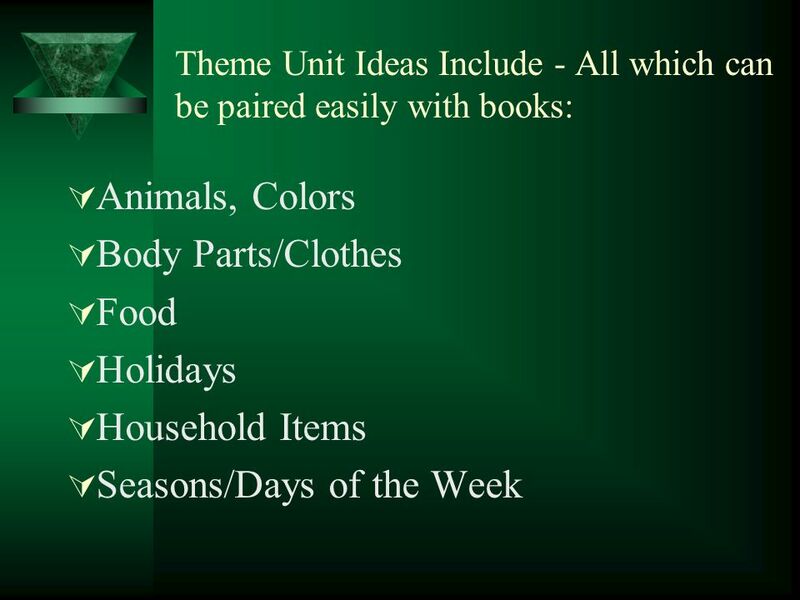 Preschool English Learners Training Manual – Chapter Chapter 8: Recommended Early. Seeds for Early Literacy Oral Language California Preschool Instructional Network A project of the California Department of Education Child Development. Faith Polk, Ph.D.. 1. Connect stages of second language acquisition in early childhood to DRDP © (2010) ELD measures 2. Discuss plans for effective assessment. National Reading Panel. Formation Congress requested its formation in Asked to assess the status of research-based knowledge about reading and the. Source: Karen Thompson dissertation. 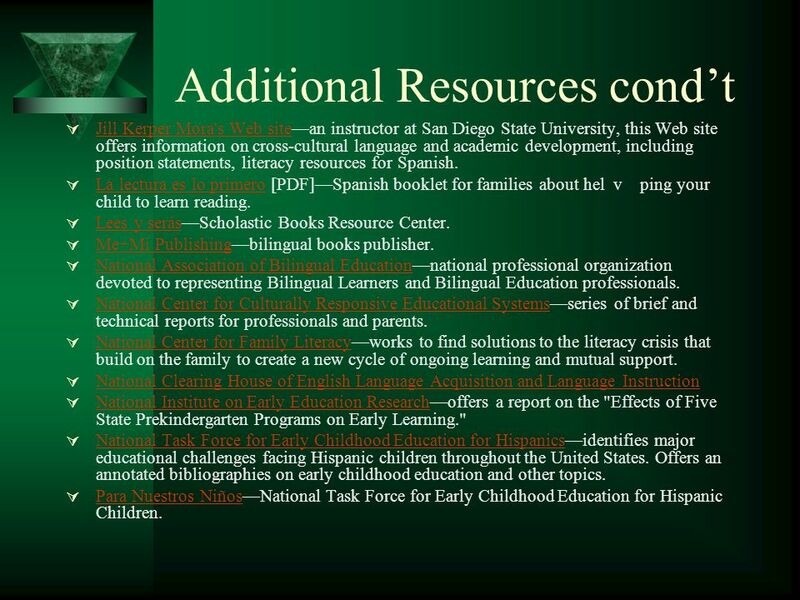 Alvaro Recognizing the period from ages three to eighth for language development is necessary for providing the. A DAY IN PRE-K CLARKE COUNTY SCHOOL DISTRICT. Clarke County School District’s Vision Our vision is for all students to graduate as life-long learners. Home and pre-school influences on early language and reading Evidence from the Effective Pre-school, Primary and Secondary Education (EPPSE) project. Research-Based Instruction in Reading Dr. Bonnie B. Armbruster University of Illinois at Urbana-Champaign Archived Information. Early Literacy Pop Quiz for Early Childhood Professionals: Phonological Awareness Barbara Reed M.Ed Head Start Region X Quality Center May 2003. 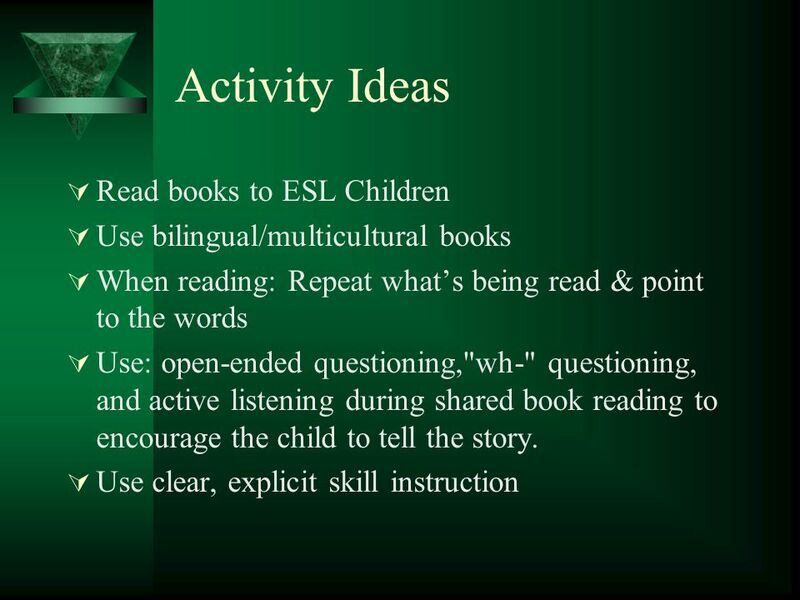 Instructional Strategies for Developing English Oral Language Abilities in Young ELLs Nora Resendez, M.Ed. Project Coordinator, Project WORLD UTPA August. 1 © 2013 UNIVERSITY OF PITTSBURGH 1 Using the content-focused Coaching® Model to Support Early childhood Literacy and Language Development How to Teach. Maine Department of Education 20051 Maine Reading First Course Session #8 Phonological and Phonemic Awareness Instruction.